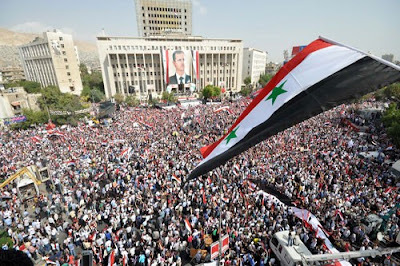 Syria: A 'Dictator' Who Has 'Advisers'! A 'Dictator' Who Has 'Advisers'! Behold, a revelation has been uncovered: Assad has advisers. For years we were fed by all western media (NATO and Friends) that the Syrian 'Regime' first is a regime and not a government and second it's a dictatorship, a one man show, a person who takes decisions by self and enforces its application on all state officials thus people. Didn't seem to be the case especially after the current events unveiled the thick veil so many in the West cover their eyes with when looking at the MENA region. Now there's an urge to look back at those using such terminology to see whether they themselves understand the terms they use? A Dictator: Is generally known to be a leader of a country who 'dictates' his vision and orders on his subordinates. A Regime: The term itself is widely being used to demonize a government that is not obliging to orders by the USA or whoever supports the mainstream media in order to justify attacking it. Bashar Al Assad is nothing near a dictator, how? Let's see..
A hacker claims to have breached the Syrian 'presidential' email system, and as many of you don't know, the presidential establishment in Syria is combined of a minister, advisers, office (bureau) manager, secretariat divisions as well as the guards. That seems to be very organized, but not our story here, this hacker who breached the email system of the Syrian presidential palace and put his hands on secret email correspondences that took place between the president office different staff came to a conclusion that president Assad before his interview with ABC Walters in Damascus quote "About 10 days before the interview, Sheherazad Jaafari - a press attache at the Syrian mission to the United Nations - sent a long email to former Al Jazeera journalist Luna Chebel, who now works in Assad's bureau. She also sent the email to an aide of Shaaban's. Jaafari, who was involved in arranging the interview with Walters, also happens to be the daughter of the Syrian ambassador to the UN, Dr. Bashar Jaafari." quote: "Jaafari Jr. wrote: "The major points and dimensions that have been mentioned a lot in the American media are: The idea of violence has been one of the major subjects brought up in every article. They use the phrases 'The Syrian government is killing its own people,' 'Tanks have been used in many cities,' 'Airplanes have been used to suppress the peaceful demonstrations,' and 'Security forces are criminals and bloody.'"" Syrian government is nothing as we were meant to understand: it consists of coherent establishments and apparatuses all constitutional and all are like most western 'democracies' if not exceeding many of them. Advisers do their job in advising without fear of repression, send notes openely and straightforwardly. So many are involved in policy making in Syria including: Officials, Advisors, Media specialists, University professors, Surveyors, and Allies. 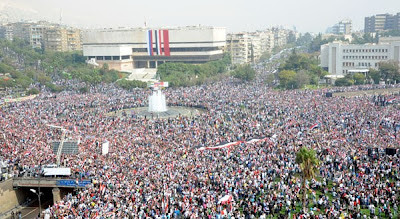 Assad advisers and government officials are doing one heck of a job assisting him in maintaining the sovereignty of the country in the face of a vicious media and PR campaign waged against Syria for over about 11 months now and more before (2000, 2003, 2005, 2006..), and in face of NATO state members and its allies, keeping in mind the size of Syria and its limited resources vs its foes. On the other hand, the advisers of world leading countries such as the USA, have driven their countries in crazy adventures abroad criminalizing their country in killing millions of innocent civilians under the guise of 'protecting them' and 'spreading democracy', and collapsing the country's economy and the welfare of own people!. 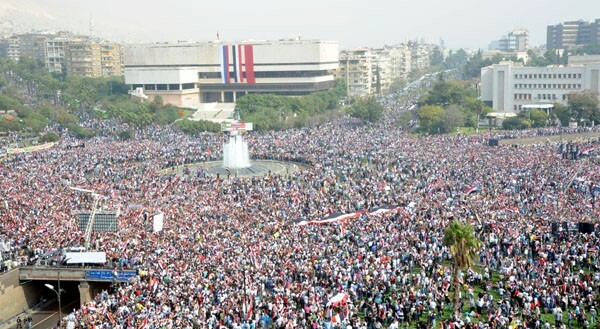 Brilliance is not an exception in Syrians, it runs in the blood of Syrians. Jaafari and his 'daughter' example. 3 ladies involved in one hacking breach (which by itself is illegal and immoral) which means the Assad is more modernized than most leaders out there and appreciates women role and don't use them for media polishing, like so many others do. Not to mention other roles women take in Syria even in the current government they lead ministries like the minister of tourism (Lamya Assi) and ministry's departments of countless examples. All correspondences have a high level language of respect and politeness, they're short and direct to the points and can only come out of educated, civilized and diplomatic officials. Unlike the Syrian opposition figures abroad embedded by NATO countries and imposed on Syrians as future leaders! Assad during the interview with Walters, as well as all other interviews never had a paper and was answering questions directly even using terms referred to by advisors. Now compare what we learned about Syria and its ruling system with what is there in the USA for example, don't compare it with the UK or should we call it UQ since they didn't have a K for a decades and a Q was there before I was even born, in addition to having a monarchy in the first place whether it has any role in ruling or just a parasite on the account of UQ (UK) tax payers. A smarter than usual opponent would hint to how Assad came to office as so many tend to do, but if this smarter than usual opponent was at least smarter than ordinary, then would find that Bashar Al Assad wasn't elected as the president of Syria back in 2000, rather he was selected to be a president of Syria by a ruling apparatus that not only got the consent of Syrian people and the Syrian People's Assembly (Parliament) and acceptance by the Army and Security, it also got the consent of worldwide leaders; and we shouldn't miss a very important point that there was no contender to him then, after his first term and even till now after almost 11 months of rioting not a single person came out and said he can be par with president Assad in leadership, politics understanding or handling a complicated country like Syria. Keeping in mind that by constitution a president in Syria term is 7 years and 2 consequtive presidencies are 14 years which in the case of president Assad we should witness a presidential campaign in the year 2014, as what the constitution of Syria says. So, what kind of a 'dictator' who has advisers supporting him in his job, a government that is intact over 11 months of riots and amidst a huge manipulation of facts by NATO and allies mainstream media, his country's army is intact and remarkably very loyal, his ambassadors worldwide never saw a single defection not even at a 3rd secretary level despite huge pressures, and over all of that enjoys the support of the vast majority of his people? Or we should believe those analyst in the Pentagon who lied at us in Iraq, Afghanistan, Libya and almost everywhere and when before and not believe the above millions? Oh gee you try hard, is there a medal for such citizen bravery in Syria? I mean come on, everyone knows that the eye doc isnt running the country himself. Als the reports of the luxerious fortress he lives in in Damascus is a big joke, id say its a mediocre house, many presidents have nicer homes than he has in Damascus. I think until the beginning of the uprise he hads some western advisors. I have some friends in the pr business and they said to get a story like the Rose in the desert of the first lady ( isnt Anisa still the first lady, what is Asma then?) you will not get just like that. There was an pr campaign to make her the Diana of the Orient, they actually flew in Mario Testino to make the pictures. The same photographer who made the most daring pictures of Lady Di. See you say that Assad is intelligent enough to go through an hour long interview. Isnt that kind of what one can expect from an eye doc who spent years in english schools? And i remember in one part he did not get the meaning of her word, surely thats human. I am glad he is not the big speech giver like his buddy Chavez, a friend who speaks better arabic than me said about the last speech that apparently he is jumping from one subject to the other with no clear connections, kind of like Maryam Noor he said. I wonder how much more we would hear him if he would be an good speech giver. I think its quite naive to think that dictators have no advisors. Even Hitler had advisors from all kind of levels, even english and french advisors. The problem within all such regimes or dictatorships is that fear is emminent throughout the regime, everyone is afraid of the other, even the President at the utmost is afraid from his own people, then they tend to address such as rats, insects or dogs. Rafik Schami who is the most famous syrian writer here in Germany( since 40 years in exile) said once that when Assad sen cam the censureship came as well. He wrote a children story in which a donkey was portrayed. The censorer did not like the story and refused giving permission that it would be published, beacause he thought the author meant the president with this donkey. Schami asked then: Why do all our arab presidents think of themselves when we authors write about dogs and donkeys? And do you get a reward for your comments on each post on my blog? The entire mechanism of the CONSPIRACY against Syria is attacking the 'regime' which they mean the person of the president in order to create a vacuum in power that will in their wishful thinking to a 'Civil War' they promise us on daily basis and increasing by day, similar to what's happening in Libya now, Egypt, Yemen, Iraq, Afghanistan.. and everywhere 'Democracy' was introduced by the USA and allies. 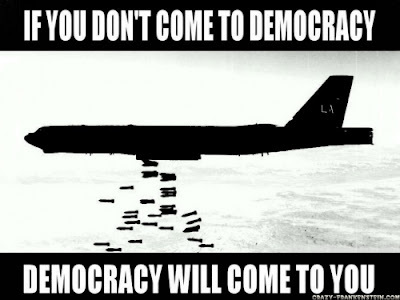 Lies like 'killing own people', 'tanks shelling', 'peaceful protesters', 'Arab Spring', 'promoting free speech'... are meant for public opinion consumption in NATO member states to justify invading new countries thus keeping the weapon companies working thus keeping bankers rich thus feeding corruption while at the same time exporting own problems abroad to avoid an internal collapse which is inevitable but your leaders are just trying to prolong it as much as possible. You read lots of different magazines and newspapers, watch different news satellite channels by different organizations, at the end: they mostly are owned by same few owners and give you an impression that they're competing, and all have the same sources: Reuters and Al Jazeera regarding Syria, that's very helpful for the credibility of those stations.. If you can't wake up they keep feeding you with the same stories and you fall for it every time, they fool you because simply you are 'foolable'.